Jo Boaler has written (with a co-author) a new paper on Visual Maths. Jo Boaler is kind of a rockstar in the Math teaching world lately. She’s started a new website called youcubed.org with lots of activities & resources backed up by research. 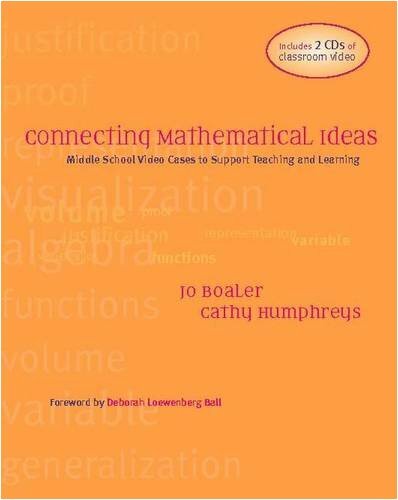 I’ve been reading the book “Connecting Mathematical Ideas” by Jo Boaler & Cathy Humphreys. The professor teaching the other section of PED3187 “Intermediate Mathematics” for uOttawa’s B.Ed. program (which I’m teaching for the first time this term) uses it with her students. Not having ready it before, I was not prepared to ask my students to purchase a copy just yet. I have since taken some time to start working my way through it & thought I would include my summary / review here on my blog as I have with other books. The unique feature of this book is that it comes with 2 CDs of videos from a middle school Mathematics classroom. Each chapter is linked to a video and the teacher & student actions in each clip are analysed by both the teacher (Cathy Humphreys) and a researcher in education (Jo Boaler). Introduces Cathy & her class; a grade 7 Math class in a middle school in California. Cathy moves away from asking students to find an algebraic rule and towards a more holistic approach of investigating growth patterns. The tasks we use in class should be carefully thought out: “How any activity is enacted in a classroom – and what the students learn from it – depends not only on the task itself but on the teacher’s image of the essential mathematics in the task”. The video shows students working through the Border Problem and how Cathy has them sharing their solutions. Cathy was not looking for the best or most efficient solution. She really works to draw out of her students all of the different ways of representing this growth pattern. Jo talks about how the same task could be a “closed task” if the teacher breaks it down too much for the students. Cathy, though, keeps it quite open for her students and carefully orchestrates a class discussion that has her students sharing a variety of solutions with each other. The students were making connections between representations and between methods also. We see the students continue their work with the Border Problem, now moving towards creating an algebraic representation of the sentences they created earlier in order to represent the growth pattern. The idea being that algebra and variables give us a shorthand version of the sentence description. I love this quote from Cathy: “It is so important to study and discuss with my colleagues the effects of different teaching moves; it is one of the things that makes teaching fascinating”. We don’t do this nearly enough! This chapter also analyses the questions from the teacher, Cathy. Teachers often resort to low-level questions that don’t demand much of our students in the way of critical thinking. We should endeavor to ask rich, open questions that lead our students to important thinking and learning. Jo elaborates on the various question types teachers use in this article and argues that teachers pose too many type 1 questions that simply gather information or work through a method (e.g. What is the value of x here? How would you plot that point?) when we should be asking more type 3 questions that explore mathematical meanings & relationships (e.g. Where is this x on the diagram? What does probability mean?). The question types themselves are worth reading just to remind ourselves of breadth of probing questions we should be using day to day with our students. In this clip, students are working on the problem “what is 1 divided by 2/3?”. Cathy really wants her students to make sense of the math and not blindly follow algorithms (like flip the 2nd fraction and multiply). This reminded me of a short e-book I read recently called “Nix the Tricks” by Tina Cardone in which she argues that students should not use the shortcuts or tricks or algorithms unless they discover it themselves and therefore understand why they make sense. Well worth the read & it’s free! I feel like this would hold each student more accountable for being part of the solution. This obviously depends heavily on the teacher developing a positive classroom culture in which students don’t laugh at others for making mistakes and in which students feel comfortable to offer up answer even if they might be wrong. Cathy also mentions “eavesdropping” on small group conversations as a way of assessing where the students are at on the topic. It is so important for the teacher to be moving around the room and “listening in” to the ideas being shared and discussed as these snippets will help guide the full-class discussion that follows. I remember Garfield Gini-Newman using this technique quite effectively during a workshop on Critical Thinking skills when he walked the room during our small-group discussions. Once back up in front of the whole group Garfield said “I overheard some folks mention …” and he would paraphrase somebody’s thoughts. I thought this was a powerful way to bring ideas to the group as it didn’t depend on the person volunteering their answer and did not put anyone on the spot as it was anonymous. Jo writes “The act of managing a productive class discussion is extremely complicated and it involves a range of important and subtle pedagogical moves”. I think I’ll use this clip in my PED3187 course in the coming weeks and ask my students to have a back-channel conversation on Today’s Meet about what “teacher moves” Cathy uses to foster the class discussion. Cathy’s thoughts in this chapter ended with the following insightful quote: “The trouble with teaching is that there are so many paths to take [in a lesson], each with different results!”. The discussion that ensues is about inductive vs deductive reasoning (without them using those actual words). Students explain that they substituted a number for n and checked that the two sides are equal. Cathy asks the students “How many numbers would you have to try before you were convinced that it would always work?”. Many students believe that, say, 10 examples would sufficiently convince them. But one student states that even if it works for the first 10 examples, the next number you try might not work, so you would have to try every number! Cathy uses a combination of interesting “teacher moves” to draw attention to & emphasize this student’s contribution to the discussion. This is so very true. And this is why I love my Twitter PLN because even outside of the school day, outside of my direct colleagues in my school’s Math office, I have the entire world of Math teachers ready to help out when I have questions, need suggestions, etc.